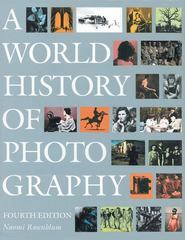 A World History of Photography 4 Edition From the camera lucida to the latest in digital image making and computer manipulation, photographic technology has dramatically changed throughout its nearly 200-year history, as succinctly explained and powerfully illustrated in A World History of Photography. Thanks to the unique immediacy with which photography captures perspective and history, the popularity and use of the camera spread rapidly around the globe. Today, photography is ubiquitous: from newspapers and fashion magazines to billboards and the film industry, cultures worldwide have embraced this malleable artistic medium for a limitless variety of purposes.Naomi RosenblumGÇÖs classic text investigates all aspects of photography -- aesthetic, documentary, commercial, and technical -- while placing photos in their historical context. Included among the more than 800 photographs by men and women are both little-known and celebrated masterpieces, arranged in stimulating juxtapositions that illuminate their visual power. Authoritative and unbiased, RosenblumGÇÖs chronicle of photography both chronologically and thematically traces the evolution of this still-young art form. Exploring the diverse roles that photography has played in the communication of ideas, Rosenblum devotes special attention to topics such as portraiture, documentation, advertising, and photojournalism, and to the camera as a means of personal artistic expression. The revised fourth edition includes updates on technical advances as well as a new chapter on contemporary photographers. Armed with the expressive vigor of its images, this thorough and accessible volume will appeal to all.